The federal government has filed a fresh six-count charge against the Director of Radio Biafra and leader of the Indigenous People of Biafra (IPOB), Mr. Nnamdi Kanu, while refusing to comply with a ruling by the Federal High Court in Abuja ordering his unconditional release last Thursday. Kanu’s counsel, Mr. Vincent Obeta confirmed the latest development saying, the federal government filed the fresh charges on Friday, December 18, a day after Justice Adeniyi Ademola of the Federal High Court granted him unconditional bail. According to Obeta, the fresh charges border on treasonable felony, maintaining unlawful society and illegal possession of items, among others. “Yes, he was charged with treason,” his lawyer said. The charges were filed by the office of the Attorney General of the Federation (AGF) and Minister of Justice, and signed by the Director of Public Prosecution in the ministry, Mr. Mohammed Diri. The federal government is accusing Kanu and some persons now at large of precipitating a crisis that would have forced the President and Commander-in-Chief of the Armed Forces of Nigeria, President Muhammadu Buhari, to concede certain parts of Nigeria to a purported Biafra nation. The Biafran activist was also alleged to have maintained unlawful society and retained items belonging to IPOB, among others. The offences are punishable under Sections 41(c) and 63 of the Criminal Code Act and Section 47(2)(a) of the Customs and Excise Management Act. 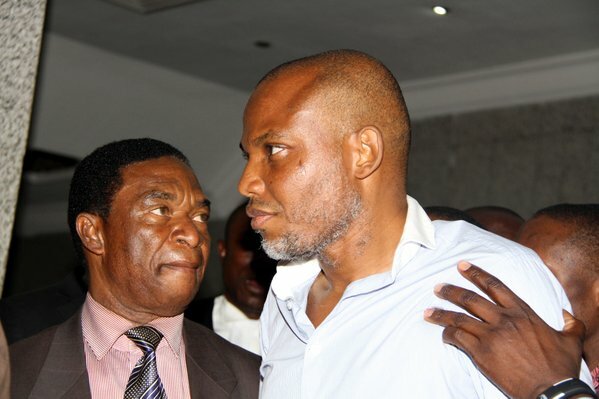 Kanu was charged alongside two other persons — Messrs Benjamin Madubugwu and David Nwawuisi.